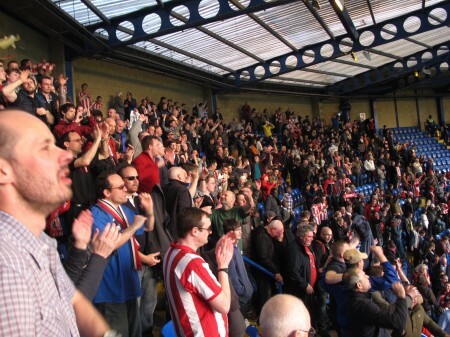 Here is another post from my early days, an April 2014 trip to see Sunderland play at Chelsea. Sunderland were then in the Premier League, but just barely, and Chelsea’s manager Jose Mourinho hadn’t lost in about 70 home games. I am leaving it pretty much as is. This is also in memory of Steve, so integral to this experience, who has since sadly passed away. Too soon, marra! It’s clear to me now that the gods of sport and travel have aimed me straight at Sunderland. There’s just no other way to explain what’s been going on. I thought I was just researching a guide to English football for Americans, which would include me visiting every ground in the Premier League. In planning a trip to Old Trafford back in January, I picked a Tuesday night semifinal in the League Cup, since that would be an easy ticket. (Here’s an explanation of what the League Cup is, along with all the other competitions in England). And I splurged on my seat at Man U, dropping 56 quid (nearly $100) for a midfield seat around 30 rows up. After I posted them on my Youtube channel, they exploded all over the Internet, being viewed more than 50,000 times in a matter of days, and I became an honorary Mackem. And right there, with the word “Mackem,” I entered a new and very entertaining world: the world of Sunderland football. Mackem is a nickname for a person from Sunderland, and my, do those Mackems love their football club. The videos led to emails, the emails to Facebook friends, and so on. And then the gods lined up another one. 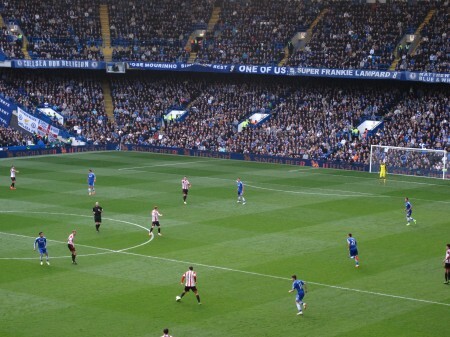 I was scheduling Round Two of my English soccer tour, when I noticed a funny little detail: Sunderland would be at Chelsea while was to be in London. What do you know about that! I emailed my new marra (friend) Steve, he arranged a ticket, and it was off to Stamford Bridge on April 19 – for, we all assumed, a thorough beating at the hands of the mighty and title-chasing Blues. After all, their manager had never lost a home league game in more than 70 encounters, and they were second in the league when the day began. Sunderland were dead last. Steve hooked me up with Scott, who had my ticket, and Scott told me to meet him at a pub near the ground called the White Horse on Parsons Green, then he added “aka the Sloany Pony.” (The pub dates to at least 1712, and “sloany” is a reference to the well-heeled residents of the Fulham neighborhood). It’s a fine pub with a pleasant patio, and unlike many local pubs it allows people from both clubs (you might say “mixed race”) to drink together. These Mackems take no small amount of pride in the quantity of pints they knock back before a match, and both Scott and Steve, when he arrived with the rest of our crew, made short order of offering to buy me a pint. I don’t drink anymore, as it happens, but I accepted a nice ginger ale, and the day was on. Scott is a fanatically dedicated lover of football. He’s been to World Cups, he’s been to 61 of the 92 Football League grounds, he’s been to untold England matches, he’s been to Chilean friendlies, and he’s been to Argentinian derbys. (If you’re wondering what’s a friendly or a derby, check out my ongoing list of terms you’ll want to know for following soccer.) Stories poured out of him as fast as the pints went in, I managed to understand perhaps 70% of it through his accent, and the mood was set for a fun and festive day in the stands. The mood in the stands soured quickly, as we realized our entire row was filled with other people. The stewards, either out of their depth or just not giving a crap, told us “Sit where you can.” We headed for an empty area near the edge of the away section, and I wound up sitting next to a line of stewards. They were taking a raft of verbal abuse for their “shocking” seat management, and one member of our party informed them that should they utter a word about any violations on our part, there will be trouble. They smiled, for a steward is indeed a pillar of patience, and let’s just say that the “Persistent standing shall not be tolerated” rule was met with minimal respect by the northeastern visitors. Ditto any ban on obscenities. 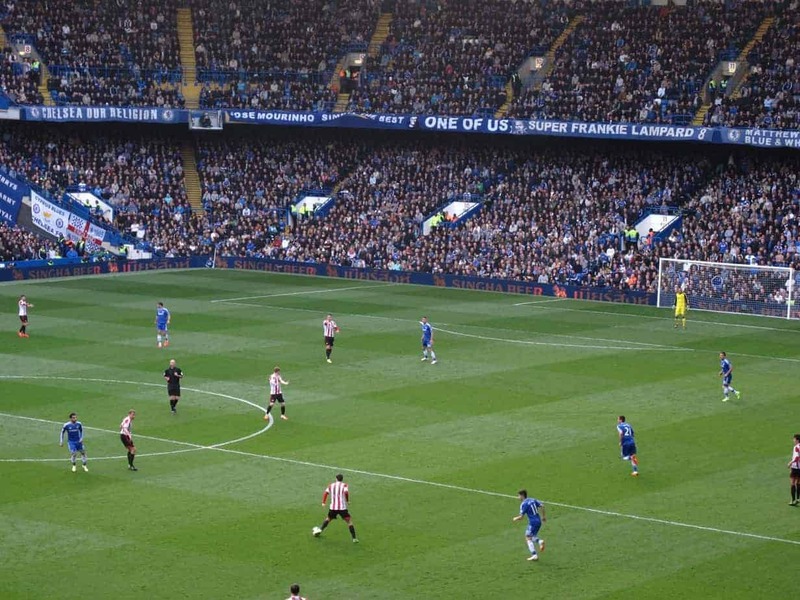 I sat with the more relaxed folks in front, as I am more of a sitter and watcher for the most part, and the game started about as expected: Chelsea dominated possession and scored fairly quickly. Waves of scorn came our way from the home fans, as would be expected, but the singing in the corner hardly wavered. They had chants of “Haway lads,” whatever haway means, as well as a rendition of “red-white-army” which, considering its speed and the alcohol blood level of its singers, sounded like “REH-wia-MAY!” They sang that things were gonna be alright, they sang that Sunderland are the by far the greatest team the world has ever seen, that its fans are the loudest the world has ever heard, and they sang more than one that I couldn’t make out at all, despite my being surrounded by at least 1,200 of them. I have not encountered such fans as those of Sunderland, in any sport. And then the “Black Cats” scored, and absolute mayhem broke out all around me. Young men leapt around and tore their shirts off, grown men hugged each other, women flashed obscene gestures at the Chelsea people … “carnage” is a word I hear to describe it, and it’s the right one. Any sense of decorum and restraint flew away, and then my goodness did they sing for the rest of the match! The Chelsea manager, Jose Mourinho, argued with the refs, and we sang for him to sit down, along with other two-syllable suggestions. We taunted “injured” Chelsea players, bellowed for cards whenever one of ours hit the ground, swapped offensive chants with the locals, and never sat down or shut up. In short, we were proper football fans. Yes, we had a lead – a moment only enhanced by some kerfuffle along the Chelsea bench and one of their staffers being thrown out of the game for trying to get at the ref. Buncha punks, those Blues. And now there was not much time to go. The singing went on, ever more fevered, but now with an element of nerves: Were they really going to do this thing? It would be a truly historic win, and incredibly valuable in avoiding relegation, but Sunderland winning at Chelsea? Do we dare to dream? The gods of sport do love something about the combination of me and Sunderland. Needless to say, they have exquisite timing, as well. 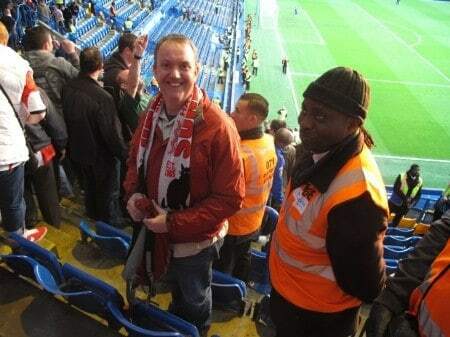 In fact, it was just after I shot the above video that one of the stewards remembered that the use of camcorders is illegal in Premier League grounds, and asked me to put it away. (Or maybe he was still quaking from our previous threats). As our jumping and screaming gave way to huge sighs and “I can’t believe that just happened,” the stewards began gently walking us toward the exits, letting slip the occasional “Well done” and then “Now it’s off to Sunderland with you.” The look on this gent’s face as I posed for my victory photo says it all: a bemused yet fatigued sense that at least he can go home now and be released from the company of these merry lunatics. One happy, one … bemused. We sang our way out to the streets, and on the way my friends suggested I might remove the scarf for safer travel. I did so, and walked them over to the buses that would take them back to the happy section of the Northeast. Word that Newcastle had gone down, at home no less, to a last-minute Swansea winner provided a little icing on our winning cake. With a round of handshakes and hugs, and with thanks from me for the 40-pound ticket Steve wouldn’t accept payment for, I said farewell, for now, to the mighty and crazy fans of Sunderland. I was in amongst those fans that night at Old Trafford. I’ll be watching your videos and reliving that amazing match for the rest of my life. Thank you. Well, I am very glad to have been there and captured the moment for all of you! Thanks for posting your comment.